While we planning the cafe project, we also thinking about how is the cafe we’d like to go. It is clear that one purpose of going cafe is to drink something, but according to the surveying by a private researching company, the main purpose of going cafe is to rest, relaxation and refreshment. But despite the result of the survey showing, there are not so many cafe which is designed in this manner. Recently we visited “Tea room Nicol” in Yufuin. We stayed here for many hours since the space is so comfortable. 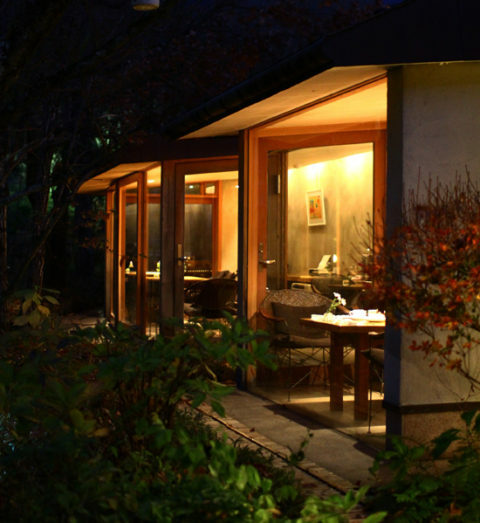 Tea room Nicol is located in the compound of an old established Japanese hotel “Tama no yu”. It doesn’t use shiny and flashy material, but indirect lighting and big boned tables with a slightly built comfortable wire chairs are arranged in slightly curved slender space. This tea room turns to bar at night. Since we are unfamiliar with the cocktail, the bartender with a cool regent styled hair asked our favor and served us a cocktail of local produced pomegranate. Although it is getting really cold outside and people tend to be staying in their house, it would be very nice to hang out and look for your special place. Photo: Tea room Nicol in Yufu-in. Copyright © 2012 H& Architects & Associates All Rights Reserved.